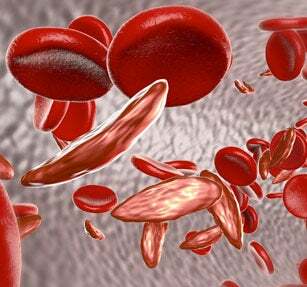 Sickle cell disease (SCD) is a chronic, genetic blood disorder which causes painful attacks (sickle cell crises) that can be difficult for patients to manage. Patients with SCD over their lifetime can have problems which affect practically every part of the body. SCD changes normal, round red blood cells into ones shaped like crescent or half-moons. Normally, healthy red blood cells carry oxygen through the body. However, people with SCD do not have enough normal cells to carry the right amount of oxygen. This causes the sickled cells to get stuck and block blood vessels, which stops the oxygen from getting through the body and causes a lot of pain. When there is a blockage, the hands, feet, abdomen, back, or chest are affected. Along with pain, symptoms of SCD can include fatigue, shortness of breath, rapid heart rate, paleness or jaundice, swelling of the hands or feet, and an increased rate of infections. Sometimes, SCD can lead to damage of many organs throughout the body, delayed growth, vision problems, and strokes. Sickle cell disease can be diagnosed by a blood test. Every state requires that all babies, before they leave the hospital, are tested for SCD as part of their newborn screening. Treatment of young patients usually includes antibiotics from 2 months to 5 years of age to help prevent infections. Children and adults should be seen regularly in the outpatient clinic to assess for symptoms, screen for complications of the disease and promote general health and well-being. We recommend appropriate immunizations across the lifespan. Many patients living with SCD experience pain on a daily basis and using the right combination of therapies can help to treat this. Developing a pain management plan with a physician or pain management specialist is encouraged at the center. BMC’s Center of Excellence in Sickle Cell Disease is the largest center of its kind in New England, serving more than 450 patients annually, from newborns to adults. The center’s multidisciplinary team is committed to providing patients across their lifespan with highly personalized care to manage their symptoms associated with the disease so they can live as normal a life as possible. The SCD team includes physicians and a nurse practitioner from pediatric and adult hematology, adult and pediatric primary care, and other specialties as well as nurses, social workers, case management and a patient navigator to help guide patients through their care. The program focuses on providing consistent care between the Emergency Department, inpatient services, and outpatient clinics. The program utilizes the pediatric STAR unit and the Infusion Center in the adult Hematology/Oncology clinic for outpatient transfusions and pain management. Monday to Friday: 8:00a.m. to 4:00p.m. To reach the Pediatric Hematologist on call, phone 617.414.5000 and page #5731.